Walz welcomes attendees to last year’s MDCE. If you’ve been in the marine industry for any amount of time, you probably know who Liz Walz is. You may have encountered her in her role as vice president of the Marine Retailers Association of the Americas (and the woman in charge of education for the association) or during more than a decade at Boating Industry magazine. Walz, 41, moved up through the ranks at the magazine until she felt more a part of the industry than an objective observer. When longtime Boating Industry colleague Matt Gruhn slid into the lead role at MRAA, he quickly brought Walz aboard to help grow the membership. Walz and her husband, Jason, live in Manlius, N.Y., a suburb of Syracuse, about an hour from where she grew up. She works from home with their two sons, Nathan, who is 11, and Benjamin, who is 6. She is a graduate of Spader Business Management’s Total Management 1 course and is enrolled in the company’s 18-month Leadership Development Program. This spring, she completed a class offered by the American Society of Association Executives called Principles of Professional Development. We talked with Walz as she gears up for the Marine Dealer Conference & Expo in December, which MRAA produces and organizes with Boating Industry. Q: Did you grow up boating? What led you to Boating Industry magazine? A: While I did a lot of boating with my family as a kid at our family cabin in the Thousand Islands region of upstate New York, I stumbled into the boating business by accident. I was in my early 20s and working for the information publishing company NewsBank in southern Vermont — my first job after college. Things were getting serious with my husband — then boyfriend — and I decided to move to Saratoga Springs, N.Y., to be closer to him. I needed a job and knew I wanted to be in publishing [and] ideally, magazine publishing. And Boating Industry magazine, then based nearby in Latham, N.Y., was advertising for an associate editor. My family boating story is this: My family has a cottage on the St. Lawrence River. When I was a kid, the cottage was my favorite place in the world. I did a lot of boating, water skiing, swimming — anything that could get us in or on the water — with my parents, grandparents, uncles and aunts. 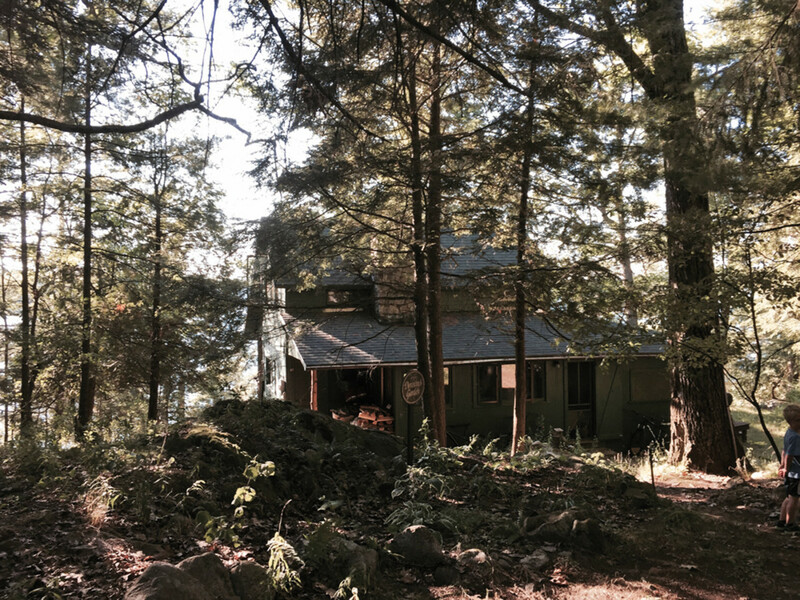 It’s a rustic cottage — my great-grandfather built it in his 20s on land owned by my great-great-grandfather — and while we’ve added indoor plumbing and a kitchen, it’s not that different than it was 100 years ago. When I became a teenager, then went away to college, my focus was turned elsewhere. I would still spend a week and maybe a weekend or two up there every year, but I certainly didn’t see myself as a boater. Then I met my husband, and he loved the cottage and loved to boat, swim and water-ski. It allowed me to reconnect to my childhood and my family. 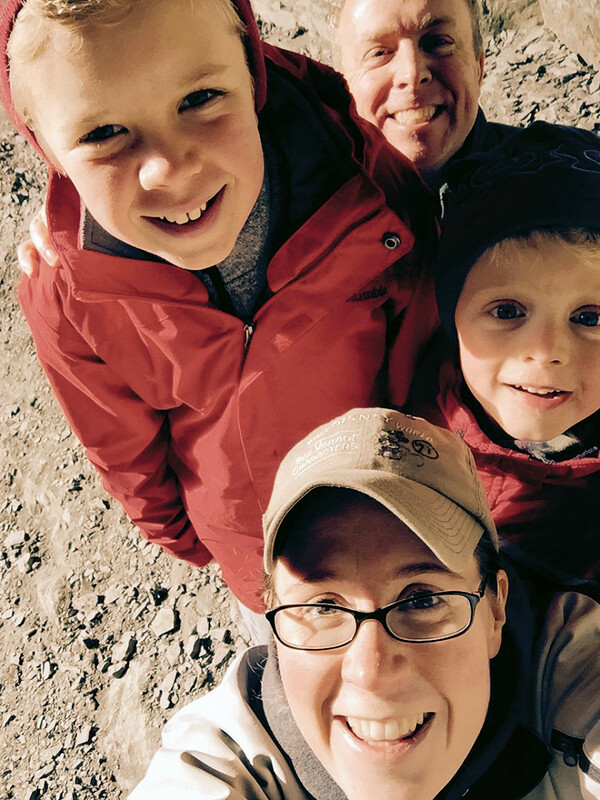 We started spending time up there whenever we could, and now that we have kids it has become a big part of their lives, too. The Thousand Islands region is one of the most beautiful boating playgrounds in the world, and there’s no place we’d rather spend family time. It allows us to unplug and have fun doing things that all of us enjoy. Walz, her husband and kids do their boating from this rustic upstate New York cabin that has been in her family for more than a century. Q: Can you talk about your role at MRAA now? A: My title is vice president, but I also serve as director of education. I work with our team and leading experts in the areas that matter most to marine dealers to produce the marketing and education for the MRAA interactive virtual training system, the MRAA resource center and all other education-related offerings the association produces. That includes marketing and education for the Marine Dealer Conference & Expo. In addition, as part of the management team, I contribute to the development of MRAA’s strategies to improve and grow our service to the dealer community and the boating business at large. Q: The MDCE is coming up here pretty quickly (Dec. 5-8 in Orlando, Fla.). Can you talk about how it has grown over the years? A: MRAA has been producing its annual conference for more than 30 years. In 2007 the MRAA Annual Convention attracted just 175 total participants. 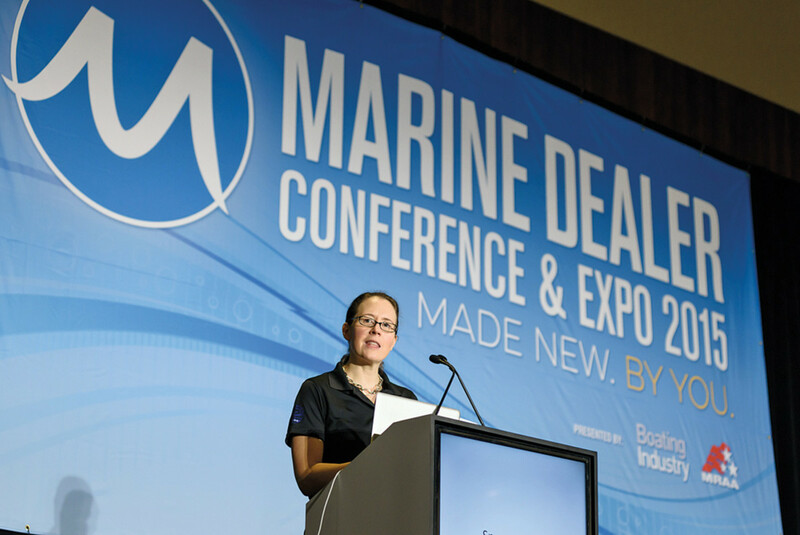 The following year, it was rebranded as the Marine Dealer Conference & Expo, and as a result of increased education, networking, exhibits and marketing, attendance began to grow. For the past six years we’ve averaged over 1,000 total participants. And we’re excited to report that this year we’re on track to break our previous records in terms of industry participation. One factor we believe is contributing to the momentum we’re seeing this year is the new December dates. Many dealers tell us December is more convenient because it gives them a chance to finish pulling their docks, winterizing boats and getting them into storage. I also think increased dealer loyalty plays a role. As a result of our efforts to improve and grow the event, the ratings of our dealer attendees in 2015 resulted in the highest net promoter score in our history at 85.87 percent. Companies that garner world-class loyalty receive net promoter scores of 75 to 80 percent. And finally, I think industry performance is part of the reason for our growth. As the boating business continues its rebound from the recession, dealers have more money to invest in training and education. 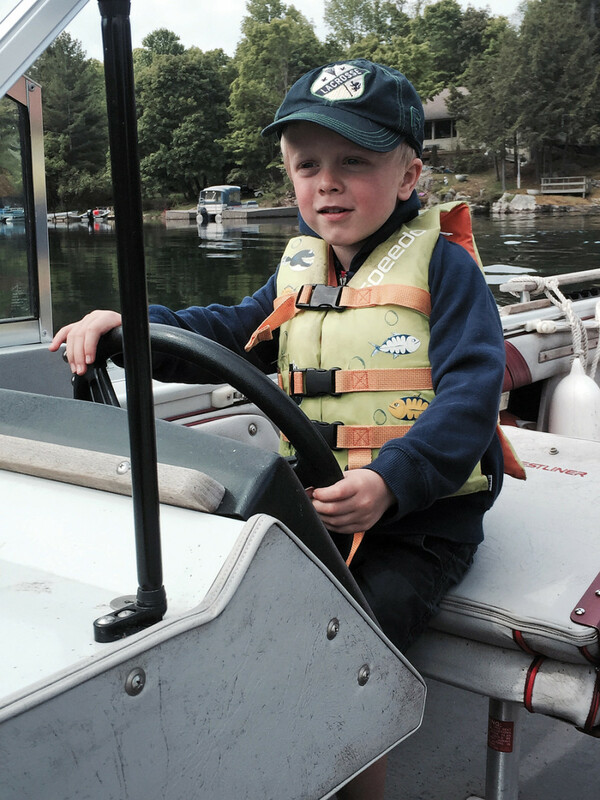 Walz’s son Ben, 6, takes a turn at the helm. Q: What are some of the major issues dealers want you to address at the upcoming MDCE? A: In the survey we conduct in the first few months of each year we ask retailers what educational topic areas are the highest priorities for them. This year, leadership and management was rated No. 1, followed by sales at No. 2. Marketing was No. 3, and service followed closely at No. 4. Within each of these topic areas, we ask dealers for specific suggestions on the education they’d like to see, and we use that information to build our session, workshop and keynote lineup. Some topics — like how to close more sales, manage time and stress or improve customer service — are evergreen, so each year we look for new ways to add value. Other topics are based on the changing marketplace. For example, dealers turn to the MDCE for guidance on how to adapt to the fast pace of change online, which is why we introduce sessions like the one on Google mobile search, local search and maps. While there is always a certain segment of the dealer community focused on succession planning, many dealership principals postponed preparations for succession during the recession and have refocused on this area in recent years. Similarly, while the topic of pay plans is always relevant, with the growth we’ve seen in recent years, many dealers have been adding staff, so we have received a lot of requests for it in the past year or two. Finally, as more millennials have reached adulthood, marine retailers have been asking for help successfully incorporating them into their workforce and converting them into customers. We have several sessions that will touch on how to gain a competitive advantage by mastering these relationships. Q: What’s new and exciting this year? A: We’re always looking for ways to improve and grow MDCE, but I’m not sure we’ve ever introduced as many new features as we are this year. And it comes on the back of 2015, a year where we also did a lot to expand our offerings, launching the MDCE scholarships and the MDCE learning lab, for example, and expanding our pre-conference workshops. I can give you a few things that we haven’t announced yet. This year we have three game-changing keynotes. MDCE has always featured an opening keynote to set the tone for the week ahead and kick off the event on a powerful note. But research shows the most memorable part of an event is how it ends, so a few years ago we added a closing keynote, as well. In fact, as part of the closing ceremony, we often ask dealers to share with us their ideas for how we can make MDCE even more impactful for them the following year. One dealer wrote on his form in 2013 something like: “Make it all keynotes.” I understand why. While the workshops and track sessions provide a lot of hands-on tools and best practices that attendees can take back and implement in their business, the keynotes are designed specifically to offer fresh thinking and innovative strategies around our industry’s biggest opportunities and challenges. The way I see it, the keynotes get us considering new ways of approaching our business, and the workshops and track sessions show us how to walk those new paths. Together they help our attendees take what they learned at the show and bring it back to their business to achieve real results. Ever since reading that form back in 2013, my goal has been to offer a keynote on each day of the show, and with three this year, we’re almost there. Another new thing is dealer-to-dealer roundtable discussions. MDCE attracts an incredibly diverse community of dealers from throughout the U.S. and Canada, all of whom are chasing new opportunities and solving new problems day in and day out. When they come together in one place, the wealth of knowledge and experience represented is just incredible. The roundtable discussions will offer dozens of tables, each featuring a topic dealers have asked us to tackle. Dealers can choose the table that best fits their goals. We are having a first-time attendee reception this year because with more than 30 educational offerings, 100-plus exhibitors and nearly a dozen opportunities for networking, deciding how to spend your time at MDCE can be challenging. In 2016, thanks to the support of Soundings Trade Only, MDCE will feature a first-time attendee reception on the evening of Dec. 6. This will be an opportunity for first-time participants to make new friends, learn more about the event, ask questions and collect materials to help them maximize their results. We are planning to do dealer case studies this year, as well. MDCE attracts leading dealers who are serious about taking their business to the next level. They’re always pushing the envelope, trying new strategies. Through MDCE’s case studies, our attendees can learn from each other’s triumphs and mistakes. During a live, on-stage interview, these innovators will share real-life experiences and tools that attendees can take back to their business. This year we’re planning to upgrade the MDCE mobile app that we introduced in 2013. Given how popular it has become and how this technology has improved, we decided to invest in an app that will allow attendees and exhibitors even more functionality. And we haven’t officially announced it yet, but one new offering we plan to launch is a stage on the Expo Hall floor where exhibitors can educate attendees on the latest products and services. This is a brand-new type of education for MDCE — one we expect attendees to take a real interest in. 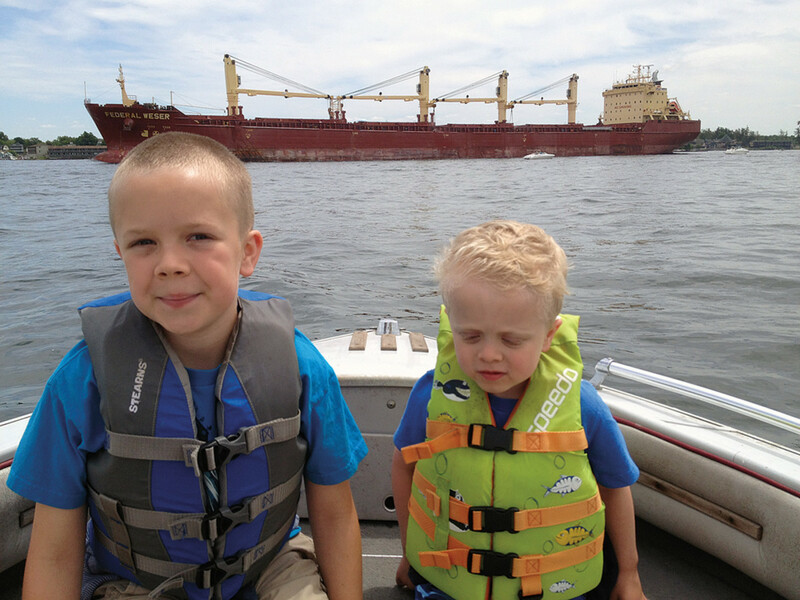 Walz says boating plays a big role in her family life and is becoming a favorite pastime of her two sons, Nathan, 11, and Benjamin, 6. Q: I know you head up education; tell me what you’re planning this year. A: What really matters about our planning are the results it will generate for those who participate. So that’s where our focus lies — continuously looking for ways to increase the take-home value for attendees. In thinking about this year’s show, what has me most fired up is the focus on innovation. In our industry, when someone says innovation, we think products. What’s the latest in hull design, electronics or engine technology? And there’s no doubt that product innovation is a key factor in the success of both manufacturers and dealers. But it’s equally important, if not even more critical, that we pursue innovation in the other areas of our businesses, from the ways in which we serve our customers and attract and retain our employees to the strategies we adopt to market our brands, lead our teams and create efficiency and profitability. The truth is, the best dealers are already innovating. Their progressive practices have been highlighted at MDCE through the Marine Industry Certified Dealership Program and at the Top 100 Dealers gala. But the speed at which today’s market evolves demands that the pace of innovation continue to accelerate, and we feel it’s our responsibility to fuel that demand. With its title, “The Gravity-Defying Leader: Innovative Approaches to Hyper-Growth Leadership,” you can see that the opening keynote is focused on how business can achieve innovation. But really, all three of our keynotes will be tackling this same area. For example, MDCE’s brand-new breakfast keynote will kick off the last day of the show with a focus on how to respond to “The New World of Work,” which mandates a bold new approach. And finally, the closing keynote by Sam Dantzler will lay out specifically how to take advantage of the radical transformation taking place in staff, customers and retailing itself. Q: What are some positive factors for boat dealers today? A: When you look at boat registration data, it paints a positive picture that matches the growth we have been hearing about from many marine retailers. Clearly, with the busy lives of so many families today, the boating lifestyle continues to offer an important respite that brings [people] together to relax and have fun. And with the economy on the road to recovery, consumers have had the confidence to invest in spending time with friends and family on the water. If you ask me, there is no better industry to work in, no better people to work alongside and no better customers to serve than those who are involved in boating today. To build on our recent growth, we’ll need to find success telling that story. While we have some stiff competition, it’s a challenge I believe we can rise to if we come together as an industry to market the joys of working in our business and the fun and relaxation of playing on the water. Q: I hear retail credit is becoming more available. Have you heard this, too? A: We have heard the same from the majority of those we’ve spoken with over the past year, though there are still a few dealers here and there that report challenges in this area. The MRAA marine retailer pulse report that we conduct each month with Baird asks dealers specifically about this area. For the month of June, it suggested that weather, the economy, new products, retailer promotions and access to credit were all positive contributors to retail demand. On the negative side, retailers reported that competition, regulations and government action/inaction were all demand headwinds. Q: Can you talk about other challenges that the industry faces? A: The two that come to mind immediately are workforce issues and government regulation. As the economy improves, not only are many retailers looking to expand their team, but there is also more competition for workers. That is only compounded by the lack of skilled labor in technical professions across North America — we are certainly not alone — and the challenges of attracting and retaining labor in seasonal markets. In addition, as marine retailers are attempting to keep up with the demand they’re experiencing, the recent changes in government regulation are serving as a distraction. The two most recent examples of this are the 78 percent increase in monetary penalties doled out by the Occupational Safety and Health Administration, which went into effect on Aug. 1, and the changes to the Fair Labor Standards Act in regard to overtime pay, which will go into effect this December. Responding to our members’ requests for help in these areas has been a significant focus for MRAA in the past year or two. And I can give you a few examples of what we’ve been working on. First is human resources online education and benefits. We’ve developed a partnership with KPA to provide human resources education and benefits to MRAA members. As part of this relationship, we have made a number of recorded webinars and resources available via our website, MRAA.com, and our virtual training portal, MRAATraining.com. Included in MRAA’s vast resources are tools and information to help marine retailers respond to the HR-related regulations, as well as recruit, hire, develop and retain their employees. In 2014 MRAA launched a career center in partnership with the American Boat and Yacht Council that provides tools and resources to a variety of job seekers and employers within the boating business — including service departments, shops and technicians — to help match leading job candidates with leading companies. Included in this career center are a resume data bank, a job-posting service, career tips, MRAA’s sample job description portal, a list of marine schools and the MRAA employee handbook sample. In 2016, in an effort to create a one-stop-career-shop for marine industry professionals, MRAA and ABYC have added to this jobs network through partnerships with the National Marine Manufacturers Association, the National Marine Distributors Association and Boating Industry magazine, and we continue to pursue partnerships with marine trade associations and other industry groups. The MRAA Educational Foundation offers three scholarships designed specifically to help the industry attract and retain marine technicians, and two others that provide funding for education and training in marine industry leadership and management. This spring, MRAA conducted a Workforce Assessment Survey to drill down into the workforce needs of today’s marine retailers and develop an effective action plan for helping them overcome the associated challenges and share success stories and solutions. Many of the solutions above are designed to serve as part of this plan. And we put a significant focus on dealer and industry solutions to the technician shortage at MDCE in 2014 and 2015. Q: Can you tell me about some of them? A: At the 2015 event we hosted a one-hour MRAA special presentation on solutions to the technician shortage. This was a panel discussion that included dealers, technical schools and manufacturers and was moderated by service guru Valerie Ziebron of VRZ Consulting. We held an hour-and-45-minute “Service Plus” track session on how to attract and keep techs, also by Valerie Ziebron. We provided free virtual training and handouts on service department hiring, firing and employee retention in the MDCE learning lab, and at the 2014 event we hosted a three-hour MDCE pre-conference workshop on how to build a service dream team. We’ve recorded a number of MDCE educational sessions on this topic and made them available to our virtual training system with the goal of providing solutions to the technician shortage to as wide a group as possible through our interactive virtual training system. MRAA members have free access to a recording of the MRAA special presentation called “The Technician Shortage,” as well as three handouts with solutions dealers can put into place in their shops. Valerie’s attract-and-keep tech session and her workshop on how to build a service dream team are available for purchase in the system and include workbooks with best practices, as well as materials like job descriptions, interview questions and resource lists. We also have developed a partnership with KPA to provide human resources webinars to MRAA members. Recordings of these webinars are loaded into MRAATraining.com for 24/7 access by MRAA members. Q: MRAA has been working hard on other types of educational opportunities for dealers. Can you tell me about those? A: Immediately following the change in MRAA leadership in 2012, the association put a focus on developing educational resources and tools. Out of this effort, the MRAA resource center was created at MRAA.com as an exclusive member benefit. Shortly thereafter, MRAA recognized the trend in virtual training and saw the opportunity to help dealers achieve their goals of continuous improvement through technology that provides convenience and flexibility, allowing employees to improve their skills and performance without leaving the dealership. In fact, our recent workforce assessment results showed that the No. 1 method dealers use to train their employees is online training, so we feel we’ve created greater opportunity for them with MRAATraining.com. Since we launched that platform, we’ve accumulated more than 45 virtual training courses in the MRAA Interactive Virtual Training System, which is also the host platform for the Marine Industry Certified Dealership Program, and that number continues to grow. By this time next year I expect us to have more than 70 courses in the system. Some of these are available as a complimentary resource for our members, and others are available for purchase at discounted rates. MDCE 2015 is what I would consider the hard launch of this system, as we were able to work out some of the technical challenges of creating a new product like this and we had enough educational content available for sale to really put some marketing horsepower behind it. During last year’s conference we sold virtual training to about 50 attendees. We spent the winter and spring helping our virtual training customers put the online education they purchased to work, and we’re preparing to launch a customer survey to help us continue to improve and grow this offering. Q: How would you say participation and feedback has been in some of those programs? A: To be honest, I think the biggest challenge that has faced our team in increasing participation for these types of new offerings is competition for the dealers’ time and attention. With the many hats most dealership professionals wear, the growth they’re experiencing and the workforce shortages they’re encountering, it can be challenging for them to make time to explore the resources available to them as members. In fact, to go a step further, I think that is actually a third challenge facing our industry — one that has faced most small businesses from the very beginning, but is growing as a result of the increased speed at which the boating business and our customer is changing, as well as the workforce shortages we’ve encountered. It can be incredibly difficult for dealers to make the time for training and education, which threatens their ability to create a culture of continuous improvement. To help with that we have recently launched the MRAA Training Toolbox, an email newsletter focused exclusively on the educational offerings we provide to our members, and we’re working to create more resources to help dealers implement them.